SIDS is not completely preventable, but it is thought that risk can be decreased by following the fundamental “ABC” of safe sleep. This means having the infant sleep “Alone” and not with other people, not sleeping with pillows, loose blankets, or stuffed animals; having the infant sleep on his or her “Back” and not prone or side-lying position; and having the infant sleep in his or her own “Crib,” and not on an adult bed, sofa, cushion, or other soft surface. Multiple intrinsic and extrinsic factors ultimately lead to asphyxia in a vulnerable infant with insufficient arousal mechanisms and cardiorespiratory function.6 In this setting, a life-threatening event and/or environmental condition occurs during sleep. Due to intrinsic vulnerability, the infant is not able to arouse to avoid re-breathing or recover from apnea. As a result, continued asphyxia occurs leading to bradycardia, ineffective gasping mechanisms, and eventually death.19,20 Each of these factors, when taken on its own, is much less significant than the combination of multiple, precisely timed events. The sleeping position is the strongest modifiable risk factor for SIDS.7,22,23 Infants should be placed to sleep in supine position until age 1 year or until the infant can roll from supine to prone and back again. Prone and side-lying sleeping positions are dangerous and should be avoided because they are associated with increased risk of hypercapnia, hypoxia, altered autonomic control of the infant's cardiovascular system, and increased arousal thresholds.13,24,25 Contrary to common belief, supine sleeping position does not increase the risk of choking or aspiration, even in those infants diagnosed with gastroesophageal reflux, due to airway protective mechanisms that will prevent aspiration.26 In addition, the upper airway sits anatomically above the esophagus in a supine position, making it harder for any regurgitated milk to be aspirated. Use of a firm flat surface covered by a fitted sheet to sleep is strongly recommended, and soft bedding accessories should be avoided due to risk of suffocation, strangulation, and/or entrapment. Sitting devices (eg, strollers and car seats) and positioning devices (eg, wedges and bumpers) should not be used while sleeping due to increased risk of injury and airway obstruction leading to unintentional deaths. The use of home cardiorespiratory monitors has not been proven to reduce the incidence of SIDS and might potentially distract from other proven preventive measures that reduce SIDS. Breast-feeding or feeding with expressed breast-milk should be encouraged unless contraindicated. Studies have shown that breast-feeding is protective against SIDS;27,28 however, the benefit is more pronounced when infants are exclusively breast-fed. A large meta-analysis study of breastfeeding and SIDS risk found that infants who were exclusively breast-fed had an odds ratio (OR) for SIDS of 0.27 (95% confidence interval [CI] 0.24-0.31) compared with infants who were not breast-fed.27 The use of a pacifier for naps and bedtime is also associated with lower risk of SIDS, although the exact mechanism of protection is unknown.28 However, the AAP suggests postponing pacifier use until breast-feeding is well established.7 In addition, pacifiers should not be attached to straps or cords as these might introduce risk for strangulation. Swaddling as a strategy to promote sleep and calm an infant has not been shown to reduce the incidence of SIDS. Recent studies have shown an increased risk of death if a swaddled infant is placed in or rolls to the prone position for sleep.31 Regular prenatal care and routine immunizations for infants are strongly recommended by the AAP and US Centers for Disease Control and Prevention (CDC).7 A supervised, awake and alert prone position or “tummy time” is recommended to help minimize plagiocephaly and facilitate motor development. The SIDS/SUID Case Registry is maintained by the CDC's Division of Reproductive Health.32 The CDC and the National Institutes of Health fund participants in the SUID monitoring program. As of 2017, SUID fund grantees in 16 states and two jurisdictions covered approximately 30% of all SUID events in the United States.32 Participants include Arizona, Colorado, Louisiana, Michigan, Minnesota, New Jersey, New Mexico, New Hampshire, Wisconsin, Alaska, Kentucky, Pennsylvania, Delaware, Georgia, Tennessee, Nevada, the city and county of San Francisco, and the Tidewater Region of Virginia.1 Participation is voluntary and those states and jurisdictions that participate in the SIDS/SUID monitoring program receive additional technical assistance and resources from the CDC. There is no federal law that requires states to participate in the CDC's SIDS/SUID initiative. For those states that do not participate in the SIDS/SUID Registry or CDC grantee process (approximately 70%), most have passed laws regarding SIDS/SUID deaths.34 The laws in these states may vary significantly, both in scope and subject, but most states have benefited from the CDC initiative by modeling their SIDS/SUID laws largely on CDC recommendations. Most states have laws that set a protocol for autopsies of SIDS and/or SUID cases and require participation of a SIDS expert in child fatality review. Some states mandate SIDS/SUID advisory councils, education programs, or counseling programs, and require data collection for use in research. Although the CDC requires special training when investigating a SIDS/SUID for child care personnel, firefighters, emergency medical technicians, or law enforcement officials, only a minority of the states do so as of 2015.34,37 Clearly, the CDC has been a major driving force to better understand, educate, and devise strategies to reduce SIDS, but more could be accomplished with greater participation of the states or the enactment of national legislation. 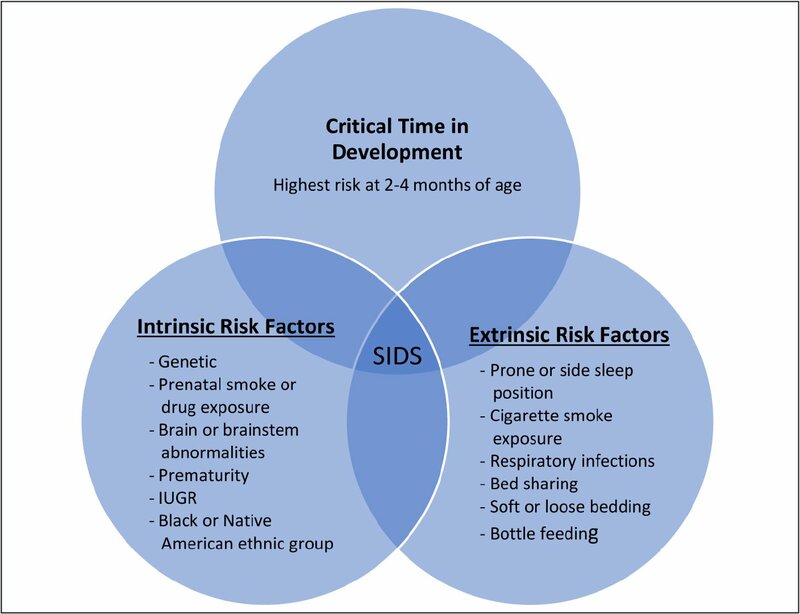 SIDS is a complex, multifactorial disorder for which continued research is needed to more completely understand the relevant interplay of innate vulnerability, a critical developmental period, and the presence of environmental risk factors. Although SIDS may never be completely eliminated, we can hope that through better education and implementation of safe sleep practices from hospital to home that we can carve away this diagnosis of exclusion to its minimum. Parents and caregivers must understand that despite the unknown nature and cause of SIDS, altering certain behaviors, practices, and interventions may influence the ultimate outcome of an event. 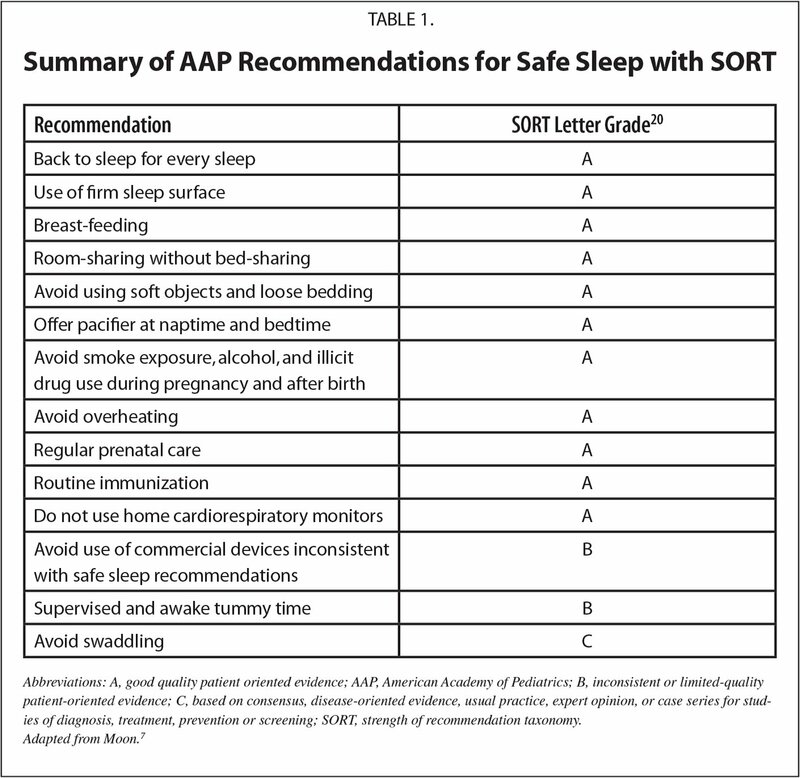 It is important for physicians, nurses, and other health care professionals to provide a consistent message and address parents and caregiver concerns and misconceptions about safe sleep recommendations. A SIDS/SUID case registry may increase knowledge on factors surrounding SIDS/SUID events and could help develop additional targeted preventive strategies to prevent this tragic event. Centers for Disease Control and Prevention. About sudden unexpected infant death and sudden infant death syndrome. https://www.cdc.gov/sids/aboutsuidandsids.htm. Accessed February 21, 2018. Heron M. Deaths: leading causes for 2014. Natl Vital Stat Rep. 2016;65(5):1–96. Yiallourou SR, Walker AM, Horne RS. Prone sleeping impairs circulatory control during sleep in healthy term infants: implications for SIDS. Sleep. 2008;31(8):1139–1146. Centers for Disease Control and Prevention. SUID and SDY case registries. https://www.cdc.gov/sids/caseregistry.htm. Accessed February 21, 2018. Centers for Disease Control and Prevention. How to use SUIDI reporting forms. https://www.cdc.gov/sids/pdf/HowtoUseSUIDIForms-508.pdf. Accessed February 21, 2018. The National Center for Fatality Review and Prevention. National CDR case reporting system. https://www.ncfrp.org/resources/national-cdr-case-reporting-system. Accessed February 21, 2018. Center for Disease Control and Prevention. Specimen submission guidelines for pathologic evaluation of sudden unexplained infant death with pathologic or clinical suspicion of infection. https://www.cdc.gov/ncezid/dhcpp/idpb/specimen-submission/suid.html. Accessed February 21, 2018. National Conference of State Legislatures. Sudden unexpected infant death legislation. Updated March 2015. http://www.ncsl.org/research/health/sudden-infant-death-syndrome-laws.aspx. Accessed March 1, 2018. Neal Goldberg, MD, is a Neonatologist, Division of Neonatal Medicine, Department of Pediatrics, Nemours Children's Hospital; and an Assistant Professor, University of Central Florida College of Medicine. Yahdira Rodriguez-Prado, MD, is a Neonatologist, Division of Neonatal Medicine, Department of Pediatrics, Nemours Children's Hospital; and an Assistant Professor, University of Central Florida College of Medicine. Rebecca Tillery, PA-C, is a Physician Assistant, Division of Neonatal Medicine, Department of Pediatrics, Nemours Children's Hospital. Caroline Chua, MD, is the Medical Director, Neonatal Intensive Care Unit, Division of Neonatal Medicine, Department of Pediatrics, Nemours Children's Hospital; and an Assistant Professor, University of Central Florida College of Medicine. Address correspondence to Neal Goldberg, MD, Department of Pediatrics, Nemours Children's Hospital, 13535 Nemours Parkway, Orlando, FL 32827; email: neal.goldberg@nemours.org.